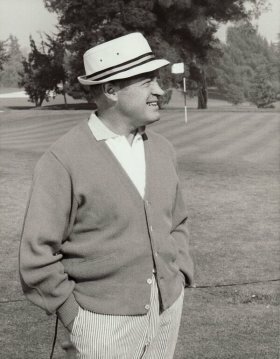 Bob Hope is more than just a revered American treasure. Thanks to his close professional relationship and friendship with the Treasure Coast’s beloved Frances Langford. he’s almost one of our own. That’s why the Elliott Museum’s upcoming offering, Bob Hope, An American Treasure, is being awaited with great anticipation. The exhibit, which is presented by the World Golf Hall of Fame in St. Augustine, celebrates Bob Hope’s comedic contributions, his achievements in the world of entertainment, his famous friends and friendships and his passion for golf. The Elliott will supplement the exhibition with items from its own Frances Langford Collection. Ms. Langford accompanied Hope on all of his USO trips and he visited her resort in Stuart on several occasions. Exciting features include a large wall map on which Ms. Langford tracked all the locations at which the two performed USO shows during WWII and authentic WAC (Women Army Corps) uniform.